Amrin is a Senior Innovation Analyst who specialises in analysing trends driving product innovation and development across the food and drink industry. The spoonable yogurt market is a volatile one which has swung repeatedly between growth and decline in recent years. The health and sustainability credentials of dairy in general, and yogurt in particular, have come under scrutiny and in some of the largest yogurt markets, consumption per capita is decreasing. Regular NPD and new, exciting flavours are needed to inject excitement in the category. Using Mintel Global New Products Database (GNPD), we highlight four yogurt trends to watch out for in 2019, from clean label to floral flavours. 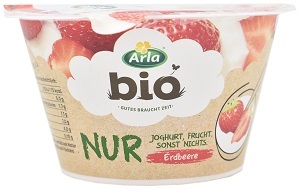 Launched in Germany, Arla Bio Nur strawberry yogurt is a stripped-back yogurt consisting of simply 75% organic yogurt with 25% organic fruit preparation. It is free from added sugar and contains “nothing else”, as suggested by the brand name (‘nur’ is German for ‘just’). The yogurt addresses consumers’ growing concerns about high sugar levels in fruit yogurts, as it contains considerably less sugar than average yogurts in Germany (6.8g-7.7g/100 g vs an average of 12.5g). 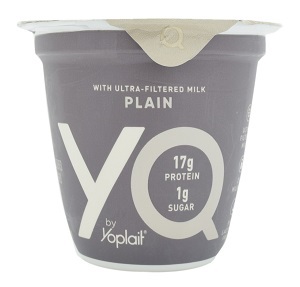 Yoplait’s new yogurt brand YQ, launched in the US, competes with many Greek and Icelandic yogurts as it’s high in protein, low in sugar (even lower than many Greek yogurts) and has a thicker texture than traditional spoonable yogurt. It’s unique selling point is that it’s made with ultra-filtered milk, resulting in a product that is 99% lactose free. 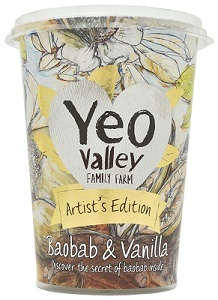 Yeo Valley launched an ‘artist’s edition’ Baobab & Vanilla yogurt in 2018: baobab is often promoted for its immune health benefits, but the growing interest in African cuisine, culture and ingredients will make it a more common inclusion in products that are positioned around energy and clean natural nutrition. Confirming yogurt’s double-sided nature, next to health claims and sugar reduction, brands also have a chance to thrive by exploring indulgence. Indeed, taste, flavour and texture are crucial elements for yogurts positioned as treats or as a better-for-you alternatives to desserts. Balanced diets are becoming integral elements of people’s self-care routines as more consumers find the modern pace of life to be hectic and stressful. People are cultivating their own individual definitions of ‘balance’ with permission to enjoy treats being an integral aspect of their lifestyle. In Italy, Müller unveiled an indulgent yogurt range with flavours inspired from around the world: Müller San Francisco Creamy Yogurt Flavoured with Raspberry Cheesecake “for a dreamy break at the San Francisco bay”; Müller Marrakesh Creamy Yogurt with Orange and Ginger “for an exciting walk down Marrakesh streets”; while Müller Santo Domingo Creamy Yogurt with Coconut and Chocolate Flakes “for a moment of relax in a beach in Santo Domingo”. Danone Oikos Yogurt with Hazelnut and Caramel Crunch is a limited edition product combining the creaminess of yogurt with the decadence of caramel and the crunch of nuts, adding an element of texture to stand out. According to Mintel research, consumers in the US are most likely to say they want their breakfast to be healthy and high in protein. While they mostly eat their breakfast at home, convenience is still important. 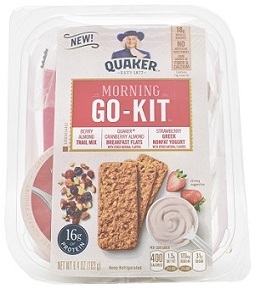 PepsiCo’s Quaker Oats has attempted to answer all of these desires with its new Morning Go-Kits – refrigerated breakfasts that contain trail mix, yogurt, and the company’s Breakfast Flats bars. 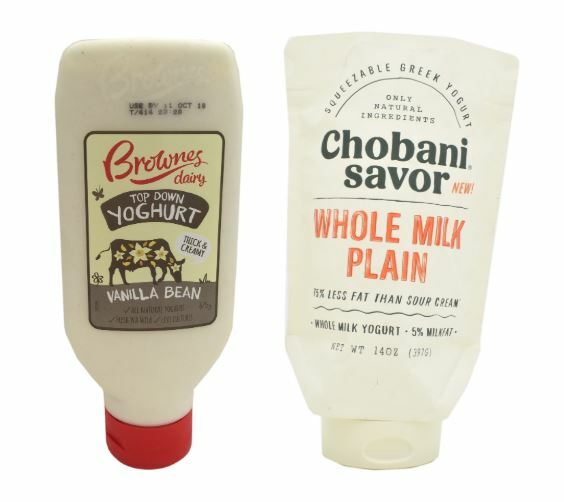 Brownes Dairy in Australia has expanded its yogurt line with a new product sold in a top down squeezable bottle, which is unusual in this category and will definitely make it stand out on the shelf from the sea of pots and pouches. The packaging can meet any occasion – breakfast, snacking, smoothies or cooking and opens up new consumption occasions such as squirting on baked potatoes, smashed avocado toast etc. The same applies to the Chobani Savor range in the US: plain greek yogurt aimed to replace sour cream, which comes in a squeezable pouch. Although flowers, herbs and spices still represent a small percentage of food and drink launches in Europe, the use of these ingredients has grown in recent years. Always looking for the next trend, consumers will be increasingly open to floral flavours in yogurt, and Mintel is already seeing innovation in this category. In China, the Yoplait range includes a rose and cranberry flavoured yogurt, while You Chun Shanghai Style has launched an osmanthus rice wine brewed yogurt, which uses a double fermentation technique. Danone Activia introduced a green tea and mint yogurt in France, while Russia’s Sibirskiye Produkty experimented with honeysuckle and Germany’s Hofmeierei Jeetzel with elderflower.